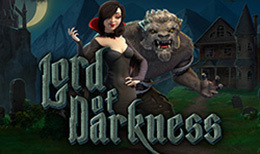 Lord of Darkness gives you the excitement of cutting edge video slots combined with spectacular graphics and animations. Each spin has a chance to award extra wild symbols and exciting free spins bonus games, starring the Lord of Darkness himself. See the Lord of Darkness turning wild in the special bonus feature and see him walk through the fire. 25 winlines to try your chances in this unique slot game that will haunt you.